It’s Monday…what am I reading? It’s been a slow reading week. I was set back by losing my Kobo for a few days. (I found it stuck between my quilt and the footboard of my bed….serves me right for, ahem, not making my bed very vigorously.) The heat made me sleepy and I kept drifting off while reading. But we’re back to normal summer temps and the words are flying by. A masterful work of art and storytelling, it is ultimately about the power of love to overcome hardship. I will not soon forget Zam and Dodola. It is as if I have been privy to the secrets of their lives in a fictional area of Mesopotamia. Thompson mixes the ancient world with the present day, stories from the Quran and the Bible, and the earthiness and sensuality of the lives he depicts. His arabic calligraphy is beautiful, and I regret that I didn’t realise there were notes to some of the pages with translation and source information at the end of the book, until I was about halfway through. I was sad as I reached the end. I wanted to know more about their lives after the last page. I’m starting Alif the Unseen next, another fantasy set in a mythical Arabian nation. I picked it up at the Random House Warehouse Sale in the spring. Now that I’ve recovered my Kobo, I’ll be continuing with Tender Is the Night by F. Scott Fitzgerald. Next up will be The Snow Child by Eowyn Ivey. It’s a fantasy set in Alaska in the 1920s, where childless homesteaders build a child out of snow. I’ve just about finished Haruki Murakami’s short story collection The Elephant Vanishes . It’s a wonderful set of stories, some more fantastical than others. For a complete change of pace, I’ll be listening to Fay Weldon’s Habits Of The House next. I’m off to Stratford tomorrow with some friends to see Mary Stuart. I”m in charge of the picnic lunch so I’m off to prep before bed tonight. Back on Wednesday! 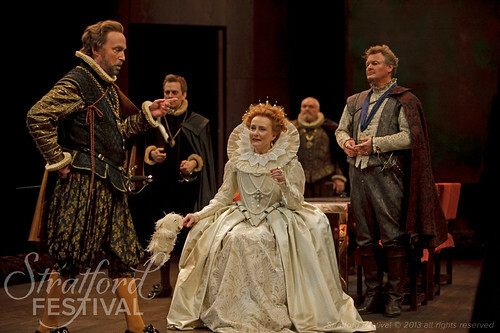 Seana McKenna (centre) as Elizabeth surrounded by, from left: Peter Hutt as Aubespine, Dylan Trowbridge as William Davison, Brian Dennehy as the Earl of Shrewsbury and Geraint Wyn Davies as the Earl of Leicester in Mary Stuart. Photo by David Hou. I have to check out Snow Child. I see it on so many blogs.